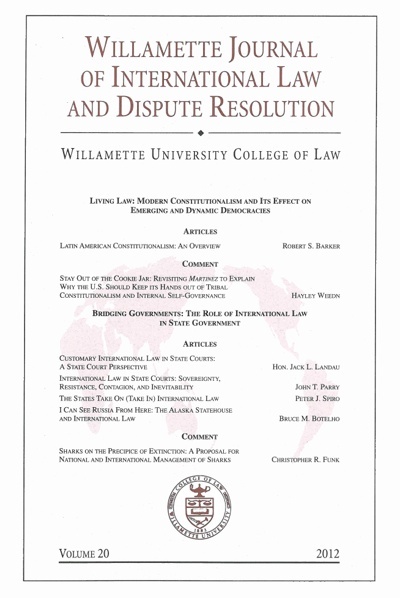 The Willamette Journal of International Law and Dispute Resolution is a student run publication containing a variety of articles written by scholars and Willamette University College of Law students discussing topics related to international law and dispute resolution. For those participating in the publication of the journal, there is a direct educational benefit. Members experience intensive research, analytical, and writing opportunities. For students and professionals who use journals either in furtherance of their education or to keep abreast of legal and political changes, the journal plays a prominent role. The journal, first published in 1992, developed out of the initiative and dedication of students wishing to encourage increased dialogue on issues concerning international law and dispute resolution. The function of the publication is not only to provide practitioners, judges, and legislators with well researched, cogent legal scholarship, but also to bring timely commentary about international legal developments to the attention of national and international readers. The journal is listed in the Directory of Law Reviews and Scholarly Legal Periodicals, the Index to Legal Periodicals & Books, and the International Council of Environmental Law Reference. The journal was originally published as the Willamette Bulletin of International Law & Policy (Volumes 1-4).